Process steam is used for cooking and other kinds of heating in P.E.I. food processing plants. But it is not always being produced at the lowest possible cost. In this issue of $mart Energy User, we would like to touch on those aspects of steam boiler operation that can make a difference in your plant — and show how improved boiler efficiency translates into dollars saved. Your plant’s boiler probably gets a complete cleaning and combustion tune-up at least once a year. As part of that process its efficiency should be measured. The next time this happens, request that boiler efficiency be measured before the work is done as well as after. The before and after efficiency figures will allow you to calculate how much the drop in efficiency has cost you since the last tune-up. This, in turn, will help you assess the potential value of more frequent boiler maintenance and combustion fine tuning. Let’s work out an example: Picture a plant that has consistent year-round production and one large steam boiler. The boiler was given a tune-up one year ago, and it’s now time for another. The technician arrives and measures a boiler efficiency of 74 per cent before the tune-up, and 82 per cent after. If boiler efficiency just after last year’s tune-up was also 82 per cent, and if efficiency degraded uniformly, the average efficiency during the past year was 78 per cent (74 + 82 divided by 2). The boiler consumed $60,000 worth of oil during the year. Of that amount, $46,800 worth (78%) did useful heating. If the boiler efficiency had been 82 per cent all year, the dollars for useful heat would have been the same — but the total oil bill would have been only $57,073 ($46,800 divided by 0.82). Keeping boiler efficiency at 82 per cent all year would have saved $2927 ($60,000 - $57,073). To keep boiler efficiency up, you have to know when it is starting to go down. Does this mean that you must do daily efficiency tests? Not at all. But it does mean keeping daily records of flue gas temperature and the percentage of at least one of the three key flue gases: Carbon Monoxide (CO), Carbon Dioxide (CO2), or Oxygen (O2). If this record keeping begins when the boiler is tuned and tested, consistent future readings will be a sign that boiler efficiency is staying up. Flue gas composition tells us whether or not the fuel is being burned as efficiently as possible. The flue gas diagram on Page 2 shows the relative amounts of the three gases at, and near, conditions of highest combustion efficiency. 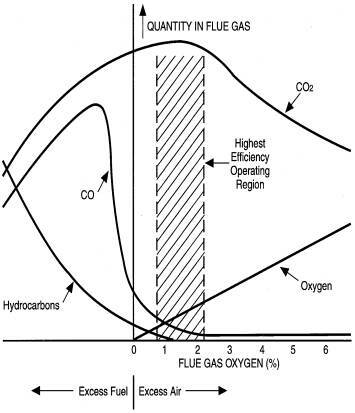 Since air is only 21 per cent oxygen, 1 to 2 per cent flue gas oxygen represents 5 to 10 per cent “excess air.” Note also how a change in any of the three gas percentages can signal a movement away from optimum combustion. Flue gas temperature is an indication of how effectively combustion heat is being transferred to the boiler water. In general, lower flue gas temperature indicates better heat transfer and higher overall efficiency. It means that less energy is going up the stack and, everything else being equal, more is going into the water. If you find flue gas temperature gradually increasing over time, this indicates gradually deteriorating heat transfer within the boiler. This could be caused by soot buildup on the fire side of the heat transfer surfaces, or scale buildup on the water side. A flue gas temperature increase of 100°C indicates a boiler efficiency decrease of 4 to 5 per cent. When you are trying to save energy dollars, the first order of business is to reduce energy losses as much as possible. Sometimes, however, there are unavoidable losses that have some potential for energy recovery. This makes the second order of business an investigation of energy recovery possibilities. Boilers on P.E.I. use well water having a year-round temperature of about 45°F (7°C). Ordinarily, it is fuel energy that heats the boiler feedwater from this temperature to steam temperature. But, if some other energy source preheats the water, less fuel will be burned. Particularly with large boilers, it may make economic sense to use recovered heat from boiler blowdown to preheat the feedwater. In other circumstances, the boiler itself may not be very efficient and the flue gas temperature may be rather high. Here, an attractive option is to put a heat recovery “economizer” unit between boiler and stack. Economizers extract energy from the flue gas and use it to preheat feedwater. Combustion air must be heated to combustion temperature, and it is energy from the fuel itself that ordinarily does that. Here, too, preheating can cut fuel consumption. Reducing the temperature difference between outlet flue-gas temperature and inlet combustion air temperature by 22°C is said to increase boiler efficiency by 1 per cent. If your boiler room is excessively hot, one approach is to draw hot air from the boiler room ceiling by running a duct from the boiler combustion air intake up to within a foot or two of the ceiling. To ensure that replacement air is drawn from the out-of-doors rather than the plant, an opening is made through the boiler room wall. This opening should be high enough on the wall so that personnel are not subjected to an uncomfortable draft. Another approach is to recover heat from flue gases using a device known as a combustion air preheater. They come in tubular and plate designs, and are made of materials such as stainless steel, teflon coated steel, and titanium that can withstand high temperatures. A new booklet entitled Energy Efficient Process Heat is now available free of charge to recipients of $mart Energy User. It deals with energy cost reduction as it relates to process heat — including the boiler room issues touched on here. To request your copy, call Mike Proud or Ron Estabrooks at 368-5010 (toll free).